Moles, more formally known as nevi, are benign skin imperfections or beauty marks. But, they may not be completely harmless. Moles possess a few activated cancer-causing genes, called oncogenes, which arise through DNA mutations. Because it takes several different mutations in various oncogenes for cancer to form, moles generally do not become malignant. However, anything that provokes mutations can, in theory, cause cancer. 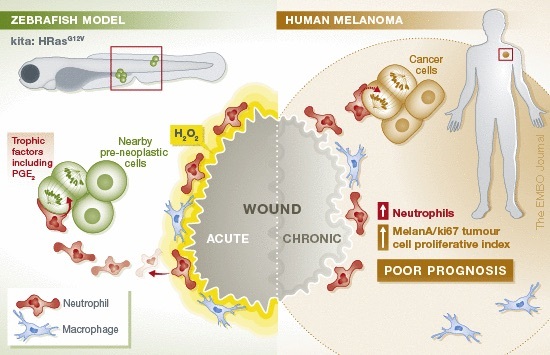 And since the pigment-producing cells, called melanocytes, that make up a mole already contain a few worrisome oncogenes, it may be wise to avoid damaging them. That, essentially, is the possibility put forth by researchers at Memorial Sloan Kettering Cancer Center in New York City. Their idea largely draws upon new zebrafish research in the journal EMBO that showed that zebrafish, which were predisposed to developing cancer due to their possession of a particular oncogene, tended to develop melanomas at body sites that were frequently damaged. How exactly this occurs may involve a particular type of immune cell called a neutrophil. These “tiny hand grenades,” as my graduate school mentor liked to refer to them, are mostly known for protecting the body against infectious microbes. When tissue is damaged, neutrophils are among the first immune cells arriving at the scene. They release toxic compounds to kill any invaders. Though this is a necessary part of the innate immune response, it may be problematic if there are precancerous cells nearby. The toxic compounds released by neutrophils can damage host cells, too, including their DNA. Furthermore, neutrophils also release a chemical, called prostaglandin E2, that can trigger cell proliferation, including that of cancerous cells. This is asking for trouble. Provoking the growth of precancerous cells in a highly toxic, mutation-causing environment may just be the perfect storm necessary to cause the cells to transform into full-blown cancer. There are at least two major caveats to this hypothesis. First, the zebrafish model used a particular oncogene that is not common in human moles. Second, cells that contain oncogenes often preemptively shut themselves down in a process called senescence. Thus, it may be that damaged human moles are no likelier than any other damaged tissue to become cancerous. Still, it may be wise to take the precaution of protecting your moles from physical injury, just in case.